Size M, 100% cotton. Made by Ripple Junction. Prepare to die. The back features nothing on the T-Shirt. -Shoulder seam to sleeve end: 6.5". -Top of shoulder to bottom: 26.5". Bob's Burgers Multicolored Graphic Shirt. Item is in good condition. Size: Small. 19" From under arm to under arm. Material:100% Cotton. Condition:Gently used. Neckline to Hemline: 25.5". New Men’s M Rick and Morty t shirt Cartoon Network officially licensed Adult Swim 100% Cotton Blue T Shirt. Shipped with USPS First Class Package. Black tee. Front has Doctor Who logo and the Tardis. No back print. Doctor Who t-shirt. Attack on Titan T-Shirt - MEDIUM Sells as seen in pictures. Shirt may show normal wash wear/pilling. Print image has no cracks or peeling. length (top of shoulder to bottom) -26". Official Rubik's Cube World's Smartest Dad T-Shirt - S M L XL XXL - New w/Tags! Office Space "PC LOAD LETTER" Mens T-shirt FREE SHIPPING! This is unlike the crappy version being sold on e-bay. Always Sunny in Philadelphia "GREENMAN" FLIP-TEE Mens T-shirt FREE SHIPPING! 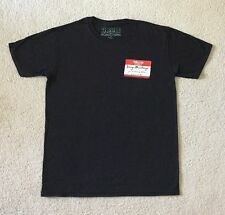 Ripple Junction Ghostbusters Logo Black Graphic T-Shirt Medium Mens NEW! 100% Authentic. Glow in the dark. Navy blue tee. Front has "The Pandorica Opens"graphic of the Tardis exploding. No back print. Doctor Who "The Pandorica Opens" t-shirt. This is one of the shirts taken out of storage recently. YOU GET THE ACTUAL SHIRT SHOWN IN THE PHOTO! Shipping: All items shipped within two business days (USPS First Class or Priority Mail) Flaws: none (Items may have slight color fade from wash/wear) Measurements: Chest (under arm to under arm) 19.5” Length (collar seam to bottom) 27.5” Returns: 30 days. Buyer pays for return shipping. Must be returned in same condition as purchased. All tags must still be attached if item is new or there will be no refund.